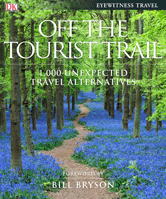 Off the Tourist Trail is a guide to the world's unspoiled sights and experiences. It takes a hundred clichÃ©d tourist destinations - everything from over-visited national parks to overrated museums - and reveal 1,000 fresh and fascinating alternative options. Written by a team of travel experts, and with a foreword by Bill Bryson, this guide brings vibrant cities, enchanting sights, breathtaking natural wonders and unforgettable experiences to life with informative narrative and stunning photography. Choose your destination by theme - Ancient and Historical Sights, Festivals and Parties, Great Journeys, Architectural Marvels, Natural Wonders, Beaches, Sports and Activities, Art and Culture, and Cities - or simply flick through this sumptuous guide and be inspired. Practical advice on getting there and around, where to stay, where to eat and when to go, as well as useful 'Need to Know' facts, ensure that you get the most out of your time away. Less crowded, generally less expensive, and often more spectacular and rewarding, these lesser-known wonders of the world encourage readers to ditch the famous but well-worn choices, reminding them what real travel is all about - escaping the everyday and embracing the new. Vacations will never be the same again.